Evergreen, Colorado is located 30 miles from Downtown Denver, Evergreen is a quiet, picturesque mountain community cradled in the Rocky Mountains at an elevation of about 7,000 feet. Search for Evergreen real estate and homes for sale here! Within commuting distance of the city, Evergreen comes complete with free roaming wildlife and fragrant forest beginning at the base of one of Colorado’s “fourteeners,” Mount Evans. The community offers an array of business opportunities and housing options. The abundance of recreational opportunities include parks, art galleries, theaters, restaurants, entertainment, and more. Thousands of acres of land in the Denver Mountain Parks and Jefferson County Open Space park systems surround the picturesque foothills community. The Denver Mountain Parks in the area are Bergen Park, Corwina Park, Dedisse Park, Dillon Park, Fillius Park, O’Fallon Park and Pence Park in Indian Hills. The Jefferson County Open Space Parks are Alderfer/Three Sisters, Elk Meadow, Lair o’ the Bear, and Mount Falcon Park in Indian Hills. Hiwan Golf Club, a country club located just east of Bergen Park, is Evergreen’s only country club. Evergreen Lake, a popular area which offers year round recreational activities, was created by damming Bear Creek in 1927. It sits above downtown Evergreen, which includes a mix of historic buildings and local businesses, including the well-known entertainment venue and restaurant The Little Bear. 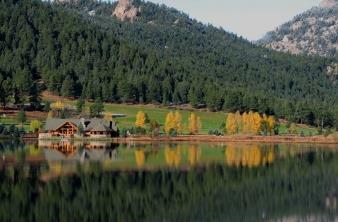 Learn about things to do and local attractions in Evergreen, visit Colorado.com. Visit the Evergreen Chamber of Commerce website for information about doing business in the area. If you are seeking to learn more about real estate and homes for sale in Evergreen, please look around and don’t hesitate to get in touch with us!